I've been using my DVD Netflix subscription this summer like crazy, catching up on my suspense and film noir queue. (My internet is too pokey to reliably stream). So far, the highlight has been this dark comedy with a very young Shirley MacLaine. I like to think of this as the original Weekend at Bernies. Poor Harry is dead, and so many people in this small town are trying to cover up his death. He is stumbled upon—literally—by person after person. Instead of getting help, they are all convinced they somehow accidentally killed him. 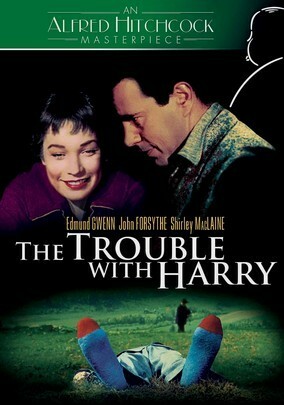 The Trouble with Harry is part screwball comedy, part quirky small town, and part mystery. Hitchcock goes a little over-the-top with the physical humor, and the romantic part of the story irritates me. No, wait...that's MacLaine. I've never been a fan. There's enough sly humor, though, to make me chuckle. I really enjoyed how genre-defying the movie was. There aren't many out there like this one. The Netflix description: Alfred Hitchcock's second American comedy demonstrates the director's flair for gallows humor. The trouble with Harry is ... he's "expired," and the residents of a quaint New England tourist spot just can't seem to get rid of him. Shirley MacLaine makes her film debut, and that's Jerry Mathers (the Beave himself) as the bewildered boy. See if you can spot Hitchcock in his customary cameo (hint: he's strolling past a limo). You can find it on Netflix or on Amazon here.